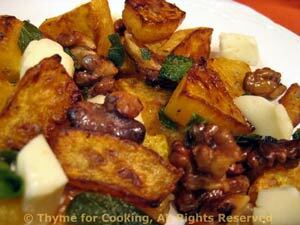 Fried Butternut Squash with Walnuts and Cheese, Thyme for Cooking. This is a simple starter that showcases the flavors of fall. Add the sage leaves at the end to just make them crisp. Use a pungent, soft or semi-soft cheese; it will melt slightly when add to the hot squash. Slice butternut squash thickly, (.5", 1.25cm) then cut into large pieces. Heat butter and oil in a large, nonstick skillet over medium high heat. Add walnuts and squash and sauté 10 - 15 minutes, until squash is nicely browned. Snip the sage leaves into large pieces and add for the last 2 - 3 minutes. Divide and put onto two plates. Cut cheese into small cubes and arrange on top.